This drink is named after a traditional Russian song that's become more of an anthem. Vodka (Russian or at least formerly Russian, i.e. Smirnoff) should be used if only to fit the theme. And kirschwasser is not unfitting because fun fruit brandies are all a part of Eastern European hard drinking culture. The nice thing about this drink is that it is juicy and strong. Lots of cherry flavors make the orange juice taste like candy, and the cherry garnish is more than just suggestive. I used fresh squeezed orange juice for this cocktail, which means it was more clear but with a lot of juicy pulp. I find store bought O.J. tastes leveled-down where you don't get sharp shifts between sweetness and tartness from beginning to the end of the sip. So it's just less interesting all around, which isn't cool. Combine all liquid ingredients in a shaker with ice. Shake and strain into a chilled cocktail glass. 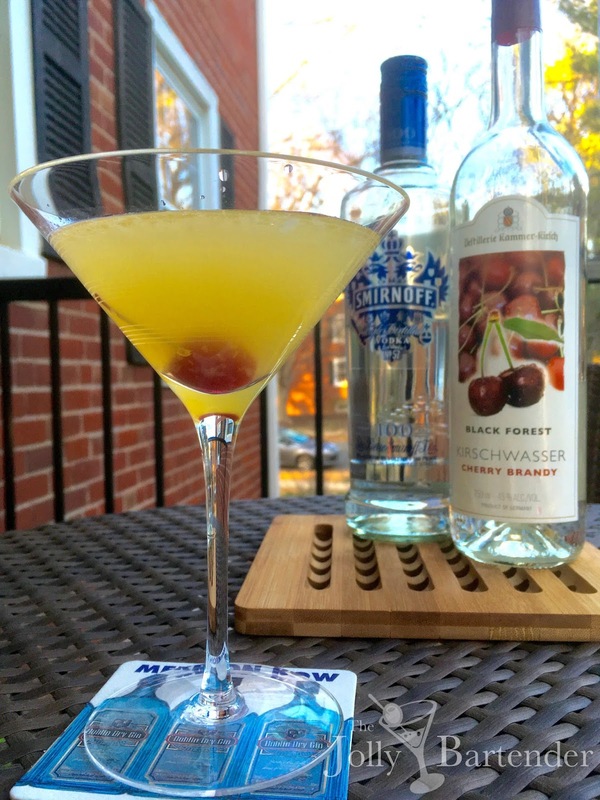 Garnish with maraschino cherry.